The tabloids constitute a genre of literature which lies somewhere between sci-fi and romance. As editors churn away at the rumor mill, they play on our inherent desire to engage with the stars ... or at the very least watch their lives crash and burn as they succumb to excessive drama (and inevitable weight gain). Here, for your guilty pleasure, the very best of this week's celebrity fan fiction. 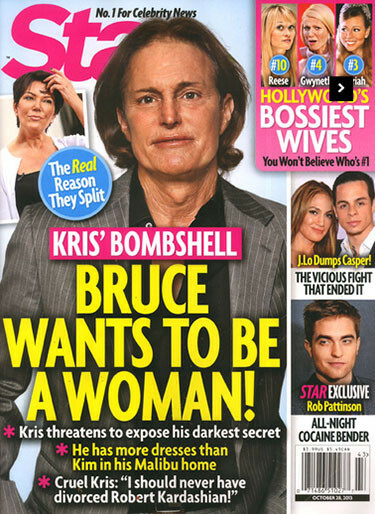 "BRUCE WANTS TO BE A WOMAN!" Let's analyze the carefully researched evidence of this story: 1) Bruce wears an earring, 2) Bruce gets manicures, and 3) Bruce has long hair. Wait, WHAT?! Those things are for girls only. The proof is in the pony tail. "70 LBS IN 4 MONTHS: YES, I DID IT!" This is actually a super-old photo of Kim. So old, in fact, it was taken before she was pregnant. However, maybe we're missing the point. "Yes, I did it!" could refer to Kim's invention of a machine which is capable of traveling through time. Quick, someone tell Paris Hilton it can be 2003 again. This is 100% real ... and also boring. "He writes her sweet notes." Really wild stuff! 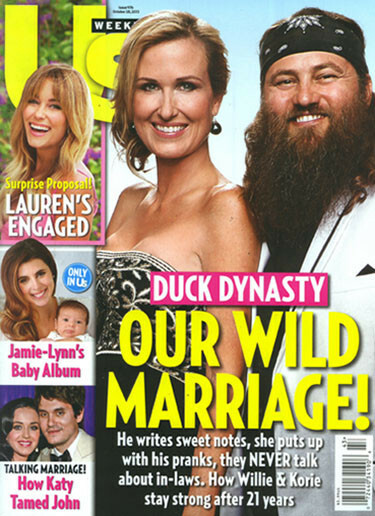 Clearly the "Duck Dynasty" kids have a deal with Us Weekly; this is their second time on the cover in a month. First of all, great use of the word "berserk." Second of all, this picture of Faith makes her look like the mom from "Carrie." Tim had better put that ring back on or he is going to get locked in the prayer closet. 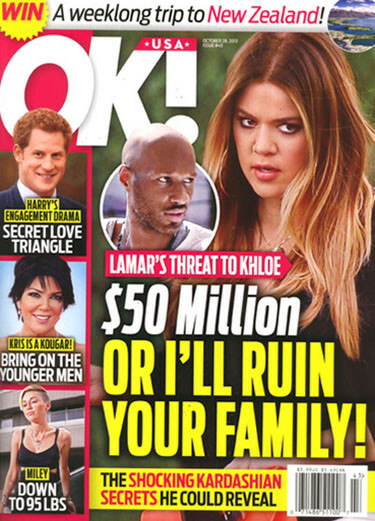 "LAMAR'S THREAT TO KHLOE: $50 MILLION OR I'LL RUIN YOUR FAMILY!" 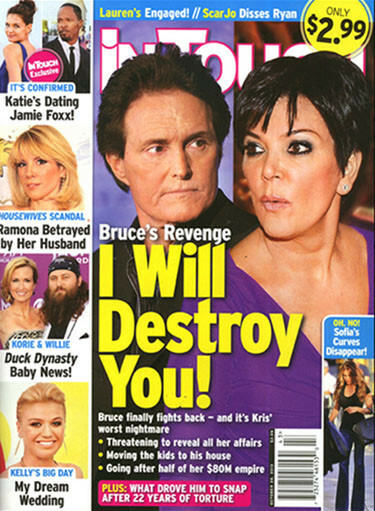 "BRUCE'S REVENGE: "I WILL DESTROY YOU!" Another Kardashian revenge plot?! Imagine Bruce and Lamar teaming up to take down the Kardashian empire. It would be Khaos! That said, if one of the two spurned spouses has good dirt on the klan it's Bruce.